Factory warranty until Jan. 10,2022 or 300 hours,whichever comes first. 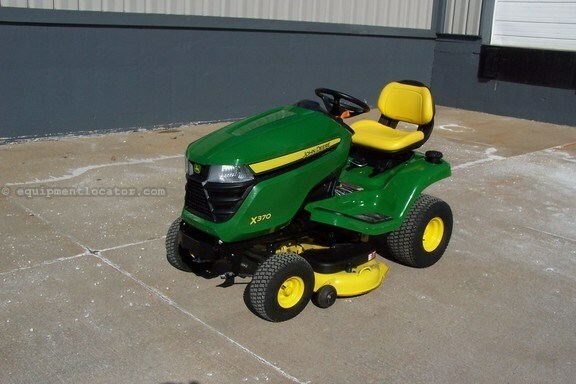 John Deere X370 lawn tractor equipped with a 42" mulching mower deck and turf tires. Power steering and hydraulic mower deck lift,driven by a hydrostatic transmission,powered by a 18.5 hp Kawasaki v-twin engine,LED instrument display with hour meter and fuel gauge,adjustable seat and cruise control. 42" mulching mower deck has rear baffles that can be removed for a rear discharge option also. Service department recently changed engine oil and filter and sharpened mower blades,making sure maintenance is done and ready for next owner to enjoy.